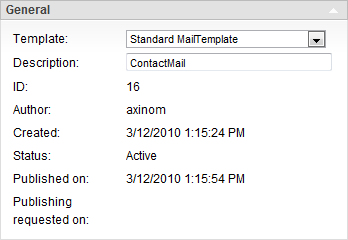 It is possible to create mail templates for various purposes (e.g. announcements, alerts, reply emails). To create a new template, go to New -> Mail Template OR Edit -> Mail Templates and click the button New in the section New on the left side of the page. 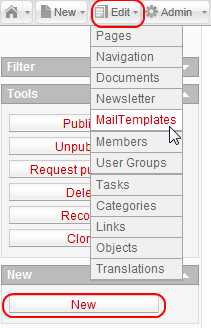 The MailTemplateDetail page opens. Here you can edit the data of the newly created mail template. Most of the details of the mail template are similar to the ones in newsletter creation, for obvious reasons. Setting up a mail template lets you easily attach new newsletters to this template later on. Please note that some tools and functions are only displayed after the saving. Saves the current mail template. You are taken to the MailTemplateOverview page. Saves the current template. You remain on the MailTemplateDetail page. Takes you one step back to the MailTemplateOverview page. Opens the page for new template creation. Takes you to the content editor of the current mail template. Returns the mail template to the unpublished state. Revokes approval of the mail template. Opens the DependencyResolverOverview page in a popup. 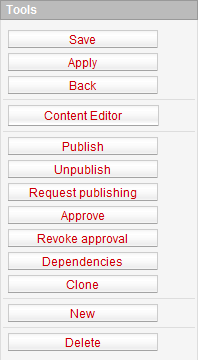 The dependencies of the current mail template can be viewed and edited from there. The cloning of the current mail template is launched by pressing this button. Marks the mail template for deletion, if the mail template is already published. Unpublished mail templates are deleted right away. Choose the base template for the mail template. Enter the name of the mail template. Unique ID of the mail template. User who created the mail template. 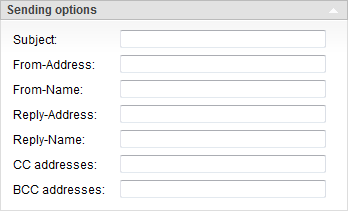 The Properties section contains links that allow you to edit the properties of the mail template. Selected properties (such as categories) are very important for future newsletter sending. 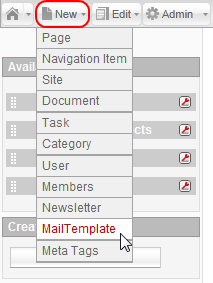 This function allows you to assign a category to the mail template. This function allows you to attach a navigation to the mail template. Subject (title) of the email. The address that the email will be sent out from. The name that will be displayed as the email sender. The email address to which replies can be sent. The name that will be displayed as the targeted person for a reply to the email. This textbox allows you to enter a plain text version of the email if you need one. If no plain text version is needed, the field can be left empty.